The gamer-centric charity Child's Play gathered more toys, games and consoles in 2010 than it ever has before, thanks in part to Desert Bus for Hope. Set the Wabac Machine to 2003 when the guys from Penny Arcade wanted to give back to the community that allowed them to make a living writing funny comics about videogames. The answer was the Child's Play charity, which collected money and donations of videogames and consoles to give to children's hospitals so that the young patients had something to do while undergoing treatment. Many thought it was an awesome idea, and, each holiday season since, the charity has given more and more games to hospitals across the US and in countries like the UK, Canada, Australia and even Egypt. In 2010, Child's Play raised a total of $2,294,317, which means that since the charity was founded, it has donated $8,998,564 worth of games, consoles and toys. On top of that smashing success, many third-party events were held to contribute to Child's Play and these events received the mainstream recognition they deserved. Loading Ready Run's Desert Bus for Hope held in November generated $207,000, and featured the gang playing the (quite boring) bus-driving sim for almost a week while guests called in to chat. The Escapist editors enjoyed dishing about games and Top Gear to Graham, Paul, Jeremy, Kathleen and the rest, but all of the people watching the streaming video at desertbus.org were psyched when Notch, aka Marcus Persson the designer of Minecraft, called in and donated $2000. While the gaming press was happy to cover the craziness that was LRR's Desert Bus for Hope 2010, we were happy to discover that the rest of the world was also paying attention. 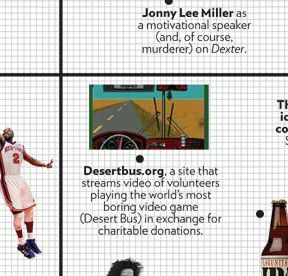 The Daily Kos, a political blog, pointed its readers to the good cause, but even more amazing and entertaining was Desert Bus for Hope's appearance on New York Magazine's Approval Matrix. Every week, NYMag plots pop-culture points on its graph measuring the qualities as High Brow or Low Brow, Despicable or Brilliant. Desert Bus for Hope was placed near the center of the graph (see image above,) but leaning towards the Brilliant/Low Brow quadrant. Check out the full graph here. Given all the attention that Desert Bus for Hope and Child's Play received in 2010, I can't wait to see what they can accomplish in 2011.